Boone resident Susan March Payne explores the emotional aspect of layered color rendered in both oils and acrylic. Her keen attention to color interaction helps to capture light, imagery and personal voice evoked within the mountain regions. Weather permitting, Susan paints “plein air” outdoor scenes and attends weekly painting sessions with other talented local artists to continually enhance her skills. The art equipment in her studio is intentionally minimal and, using an ever-present phone camera as a primary resource, she recreates her best photos taken while exploring vistas of the High Country. Embracing the stunning beauty of North Carolina’s Blue Ridge Mountains, Susan’s paintings deliver scenes in a manner that allows the observer to visually provide the constant flux of environmental color for a rewarding and very personal interpretation. A culmination of rigorous practice and academic training tempered with decades of teaching Art in K-University levels in Virginia Beach schools, Charlotte area schools, The Mint Museum, Florence Thomas Art School and ArtSpace has fueled Susan’s lifelong passion for painting and art education. Grateful to live in a town that embraces artists, Susan has exhibited in both the Watauga and the Ashe Arts Councils’ juried and open exhibitions. She recently was honored with Artist Residency at both Wildacres and Blowing Rock’s historic Edgewood Cottage. 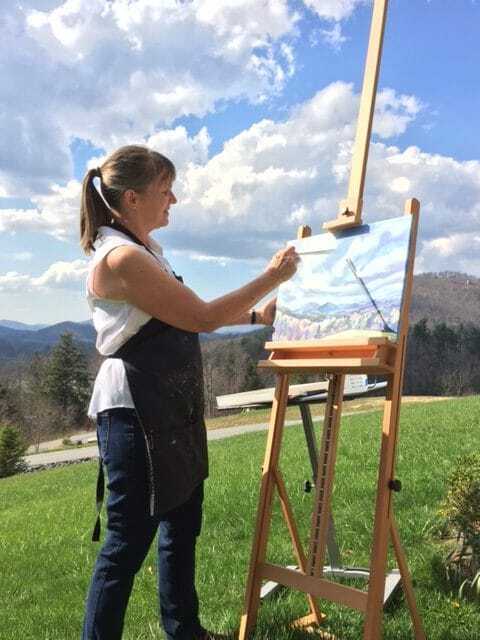 Susan gives back to the community by exhibiting harmonious area landscape paintings in medical facilities in Watauga and Ashe counties to provide precious moments of joy to patients and families. “Living in our mountain community has been a flourishing time in pursuit of High Country vistas and creating visual interpretations from this awe inspiring region.